Brigadoon (2005) | The first and second graders rehearse in the Burns Park Elementary School auditorium. They were practicing being startled. I love telling people about how my photographic career got started. It’s a “follow your bliss” kinda story, and it all started with the Burns Park Players’ production of Brigadoon in 2005. I had been a graphic designer for 18 years, and had spent the latter half of those years in a terrible rut. Photography gave me joy, even though my super-active toddler often outran my camera (oh, to be so mocked!). Photographing Brigadoon gave me the chance to capture a broader range of subject matter, tell a different story, and meet a talented community — people who were much less likely to run away. One of the Players had already volunteered to photograph the performances, so I was more than happy to photograph the behind-the-scenes activities instead. A cast and crew of hundreds work on the show for about 3 months before curtain. It was easy for me to imagine the rich visual possibilities: kids in rehearsal, sets in progress, rows of costumes, make-up, etc. Lesa Huget, Players board member, came up with the idea of displaying the images outside the auditorium for opening night. Not only would this give people waiting in line something to look at, but the collection of images would begin to describe the complex work that goes into these productions. Work accomplished by previously invisible crew members, who could finally be recognized — literally! My first exhibition, and I was euphoric with how well it was received. I was quickly offered three different photography jobs: an actress’s headshot, the Ann Arbor YMCA’s opening gala, and a bat mitzvah party. This was unexpected since, at the time, I hadn’t entertained the possibility of becoming a professional photographer. But it was certainly enticing. Just one weekend after Brigadoon, my husband and I toasted the beginning of my new career. One year later, with the opening of Fiddler on the Roof, I opened Myra Klarman Photography to the public at large. 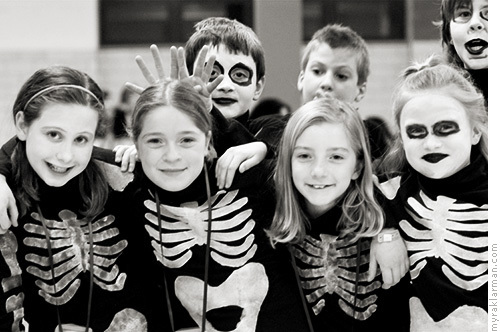 Fiddler on the Roof (2006) | Ghoulish fourth graders hang out in the Tappan Middle School cafeteria while awaiting their big dream scene. Oliver! 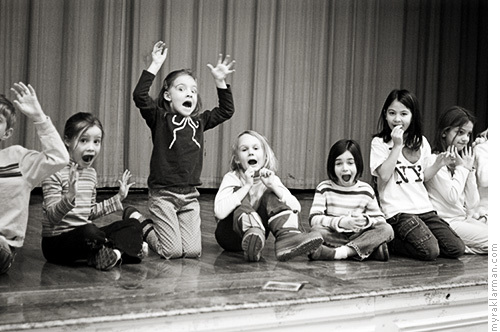 (2007) | First and second graders are excited to take the stage at Tappan. Don’t look now, but one of them has a spoon! 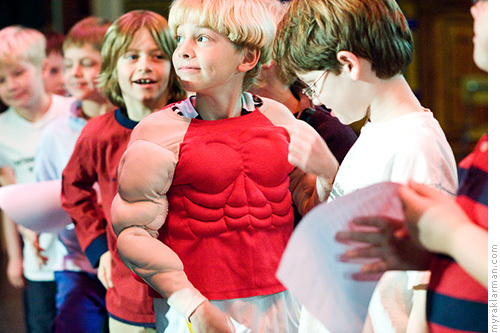 Beauty and the Beast (2008) | The third grade boys during rehearsal at Tappan. I can’t be sure, but I think one of them might be juicing. The Players’ 25th anniversary show: Beauty and the Beast (February 8–16). From my photojournalistic snooping thus far, I can attest that this will be another awesome production (also, my photos will be on display, which is gravy). The fact that so many kids are participating tells me this will be a very popular show — i.e., likely to sell out quickly. In other words, if you want to see this show (and you do), don’t wait to get your tickets. Tickets for reserved seats are $15 and are available beginning January 30 at Morgan & York, 1928 Packard. Complete showtime and ticket information is available at the Burns Park Players website (see the marquee-ish looking sidebar). About the Burns Park Players: The Players is a group of adults who live in the Burns Park School community (as defined by the Ann Arbor Public Schools’ attendance area boundaries) who join together to produce one musical show each year. The elementary school–age children (grades one through five) of Players members may appear in the musical production. All proceeds are donated to school or school district needs. Since 1992, the Players has donated over $200,000 to a variety of arts-related programs in the school district. I didn’t realize it was the Burns Park Players that got you started! Reminds me of how I “started,” taking photos of kids at a Music Together class. (I put it in quotes because I’m still doing the whole day job thing.) Great idea on Lisa’s part to display your photos, and better still for others to recognize the obvious talent on display! Sounds like an excellent community to be involved with, both the Burns Park Players, as well as the folk who patronize them.